From the kitchen of One Perfect Bite...I have, for years, had atrociously bad luck making lime curd. More often than not, it breaks or refuses to thicken and I'm left with a delicious but runny mess that's not much good for anything - especially my reputation. I've been looking for an easy, fool-proof recipe to solve the problem and I finally found one in a most unusual place. 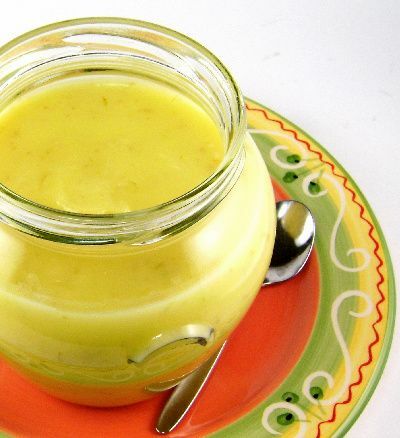 The recipe comes from the Pacific School of Herbal Medicine and it's called Adam's Lime Curd. If third time's a charm, then the curse visited on my curd has been broken. I made Adam's recipe for the third time tonight and used the curd to make a tart and fill a layer cake. The results were spectacular and I'm thrilled. I love the "bite" lime adds to desserts and this is a recipe I'll use over and over again. I've been using common Persian limes to test the recipe, so I know you'll have no problem getting the ingredients you need to make this on your own. It's easy to do and if you like tart desserts I know you'll love this. Here's my version of Adam's recipe. 1) Melt butter in top pan of a double boiler set over simmering water. Add sugar, lime juice, half of lime zest, eggs and salt. Whisk until curd just begins to thicken, about 5 minutes aside half of the zest. Then stir continuously, alternating with a whisk and a wooden spoon until curd thickens. Add remaining zest. Continue to stir continuously, alternating with whisk and wooden spoon until curd thickly coats spoon, about 5 minutes more. 2) Remove curd from heat and whisk until no more steam rises. Pour into a glass jar. Cool completely, then cover and refrigerate. Yield: 2 cups. I love any lemony and orangey stuff. I definitely love this one...mmmm. I have to try. Thanks for sharing. Hope you have a lovely weekend. This sounds great! I love lime and for a dessert this has got be be delicious. Can't wait to try it! I am looking forward to a tart or cake post with this lime curd. Lime curd sounds as good as lemon but much stronger in flavour and of coz smell as good. Thanks for the recipe & have a great day. I often make lemon curd, but I never made lime curd, what a great idea! Do you think that lime curd is more difficult to set than the lemon one? When I will find the time I will get back to this recipe and try it! I love lime curd as much as lemon and limes are usually so much cheaper -- there is nothng better than a lime pie! I will definitely keep this recipe. I wanted to make a lime pie that wanted curd but I was not familiar with it. i found some recipes on the internet but I wasn't sure. Your recipe posted just in time. Since it was a success for you, it will be for me as well. Thanks Mary. I thought it was just me who failed at making lime curd! I've always had success with lemon curd--never lime curd. In fact, I quit trying. You've inspired me to give it another go. I have five of the juiciest limes I've ever seen in the crisper at the moment. Perfect timing. This curd looks really good! I had tried making lemon curds a few times already without much success too...maybe I'll give this a try! Thanks for sharing! Oh my, I can just taste that fabulous tartness! What a great recipe, thank you! I love finding recipes in unusual places! Looking for new recipes is almost like a treasure hunt, as a fantastic one can pop up anywhere. This sounds incredible, Mary! I love citrus curds! This one looks delicious! I've recently discovered the joys of lemon or lime curd. This looks fabulous. Last time I made lemon curd the consistency wasn't right, but I'm sure your recipe will be foolproof. yum. One of these days I'll get around to tring my hand at a curd. Lime sounds amazing! Thanks for sharing this with us Lydia!! Mary you got me salivating when I came to that part when you said "if you love tart desserts you'll love this one" It's 7 am our time, half awake, and my eyes still squinting, I see this post... now Im craving hahaha! Oooo my mouth is watering! I love citrusy things and can think of so many ways I'd love to use this gorgeous curd. I love lemon curd, so I'm sure I'd love this as well. Thanks for finding this recipe! It would never had occured to me to make curd, until now! This is really beautiful. I love anything LEMONY.. I see the work you put into it really paid off. i have heard of lemon curd, but not lime. It looks so easy! And delicious! I've never attempted to make curd but I do love eating it! I'm glad that you posted a foolproof recipes, so that us beginners can give it a shot without fear! I've had a problem making lemon curd before...good to know I'm in good company!! I can't wait to try this one! I loved the photo and the plate you used. I never had lime curd before but I'm sure I'll enjoy this. I love the sharpness and freshness of limes. And I never made any curds before, it's something I'd like to try. Hi, Mary! Thanks for stopping by my blog again! I can't tell you how thrilled I am to pop over here and find this lime curd recipe! JUST what I wanted. I have some limes that needed a home. Beautiful! I love lime. I think this would be delicious with a sour cream cake. This looks so fantastic! I've only had lemon curd, so this would definitely be new for me. I can just taste it on a warm scone or in the tart you describe.. Thanks for sharing this!! Gorgeous! I love lemon curd and anything else citrus so this is a definite must-make recipe! Your lime curd looks wonderful! Good job, Mary...! This is certainly bookmarked! A reminder that I need to make my lemon curd before the lemon season goes away! I love lime "anything" and this recipe is going directly to my file! Thanks. I could truly eat that whole jar with a spoon! Citrus curd is one of my favorites! I've never made lime curd. I have made lemon curd with less than spectacular results (so now I buy it). But will give this a go - love lime flavors and can just spread the lime curd on a scone and be in my happy place. So glad that this turned out! I imagine that the curd would make a wonderful filling for a coconut cake. Ideas are brewing! How cool - I recently bought lemon curd from Trader Joe's but it's really cool seeing how you can make it at home! Hi Mary ~ I am glad you enjoyed my account of meeting Ree, The Pioneer Woman. You asked about Wes. He is my husbands friend. We girls drug the boys along with promise of dinner out. Tomorrow I am actually posting a recipe - I think you'll like it. Oh yum! I love lime curd and for some reason it is tricker than lemon (I wonder why that is?) I'm going to have to try your recipe soon. I LOVE curd. I love making it just as much as I love eating it. The colour of this one as wonderful. I've never tried a lime curd before so will be book marking this recipe. Oh I love a good lime curd. I really need to make one, soon!! Mmmm. I made lime curd once and it was outrageously delicious! Yours looks perfect! This stuff is so delicious! Thanks for the idea...and the Sugar Rush!